2018 was a “sporty” year for the RS Aero Midwinters, once again co-hosted by Sailfish Club of Florida and Palm Beach Sailing Club in Palm Beach, FL. It was WINDY. Like 40 knots on Friday (so no sailing during the clinic), and gusts into the mid-30s on Saturday (which laid down to a pleasant 12-20 as soon as the committee abandoned ashore for the day, natch). 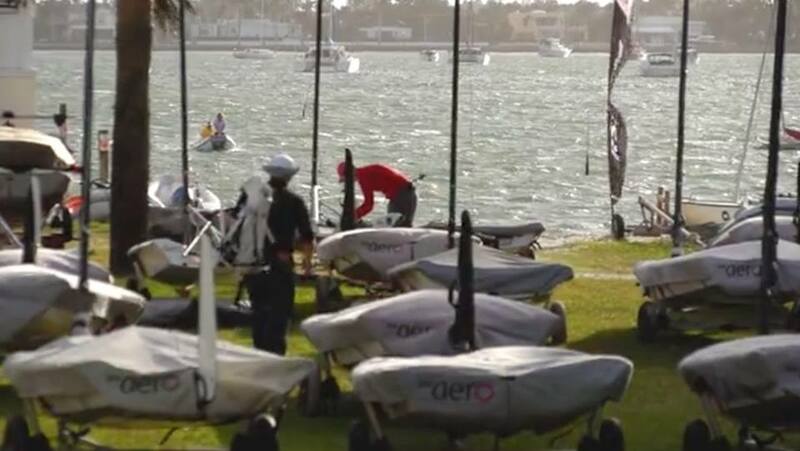 At least Sunday dawned sunny and warm, the breeze considerately moving a smidge south of East allowing easy launching into Lake Worth for 5 races in 10-20+ knot breeze tumbling over the barrier island just to windward of the racing area. It was a tough day to get used to an 85-lb speedster, but several class newbies joined seasoned owners, swelling the ranks to 26 entrants. 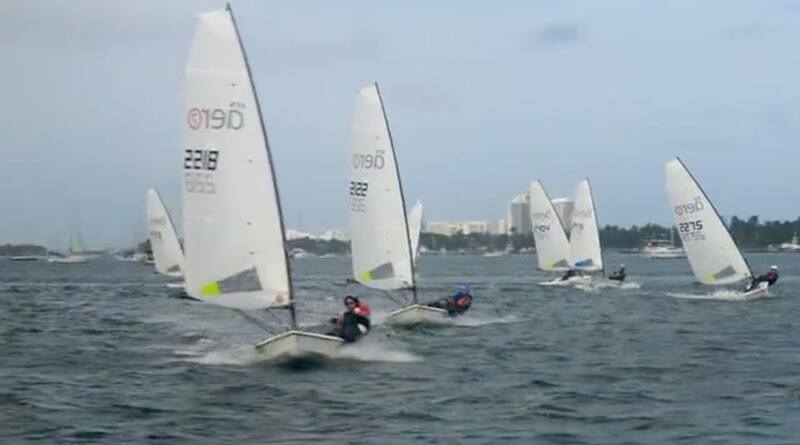 This was truly an international competition, with sailors from Canada, UK and Tennessee plying the warm waters of Lake Worth. Even the big boys who went out Saturday after race cancellation were impressed enough by the jagged breeze to switch down to 7s for Sunday’s racing, resulting in a robust seventeen-boat fleet. Class newcomer Bob Patterson, sailing in his first Aero regatta as an owner, placed a close 3rd to 2017 North American Champion Hank Saurage, who was heard saying he felt a bit “off” (wonder if it was the thirty-two-ounce Rum & Cokes he and Ash Beatty were witnessed downing on Saturday?). 2017 RS Aero 9 World Champion Marc Jacobi from Connecticut overcame a disastrous first race (replete with a foul, lost tiller extension, and embarrassing use of profanity, all on the first leg!) to top the podium. Farthest Travelled award: #TeamLymo UK dead heat. Julie won the arm wrestle tie break. Best Beard: This is, of course, a highly subjective award. Does one go for Wild-n-Wooly (Tim Desmond/Bruce Avery), One-Notch-Down-But-Dang-That’s-Thick (Jim Myers) or Carefully Coifed (Jesse Winterbottom)? In the end, Chris Schmitz wins for excellent symmetry, balance and fulfillment of mission (capture of energy bar crumbs and bringing ladies to the yard). Best Regatta-mobile: Hank Saurage, who raised property values from Baton Rouge to Palm Beach by driving his tasty Indus Silver Jaguar XF SportBrake to the event with boat on top. Honorable mention to Bob Patterson in his Porsche Cayenne S.
Coolest Pic on a Bathroom Wall: Paul Gingras, former Commodore of Palm Beach SC, looking quite stylin’ at the helm of a Santa Cruz 50 in the middle of the Pacific aimed at Honolulu. “Best” Expletives, Weather Mark Edition: Marc Jacobi and Ash Beatty (unbreakable tie). Sorry again, Ash! With heartfelt, profuse thanks to Palm Beach Sailing Club and Sailfish Club of Florida, the RS Aero fleet moves its sights one hour north, where next weekend the class contests its 2nd Annual Florida State Championship at the US Sailing Center in Jensen Beach, FL. Will the fleet get blown away by honking Easterlies again? Will Hank shake off this weekend’s hangover? Can anything tame Tim Desmond’s beard? Stay tuned!